Discover your personal style & free yourself from clutter. more overwhelmed than the one before it, and I was about to give up and overpack, again, when I stumbled upon a neatly organized Parisian packing list that fit into a small carry-on. From there I discovered capsule wardrobes, The 10 Item Wardrobe, Project 333 and countless other minimal closet concepts. approach to dressing, and that a few key pieces were all I needed to look & feel fantastic every day. with only a few pieces? subject suggested otherwise. So, I decided to give it a try and here I am, years later and finally happy with my closet and more in tune with my personal style that I ever thought was possible. I know what I love to wear and what I don’t and I’ve slowly built the wardrobe I always dreamed of having. Here, and on my YouTube channel, I hope to share what I’ve learned with you so that you too can discover your personal style and finally free yourself from clutter. 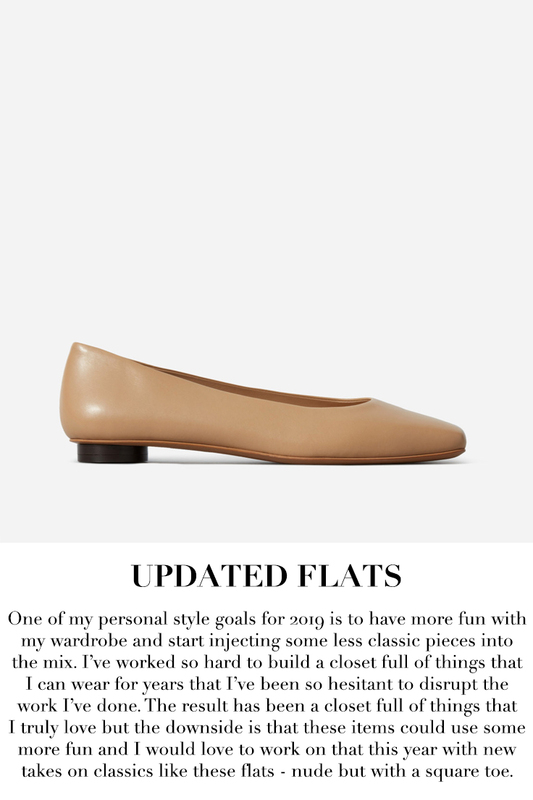 If you’re new here, I’ve linked some good places to start below including my own personal closet & style ethos, the 10 items I alway have in my closet, my wish list and how it keeps me from making impulse buys and a few of my favorite wish list outfit planning collages that I use to decide if an item will work with my existing wardrobe. You can also see ongoing updates, inspiration and outfit posts on my blog here. Here, I've outlined the main colors, silhouettes and descriptive characteristics that I strive for in my wardrobe. In the last few years as I've really honed in on my personal style, I've found that keeping this focus at the heart of my purchases helps ensure that I make smart buys that I'll actually wear. By following these points and constantly reevaluating and adjusting them as I get older, I move etc, I've been able to slowly but surely build a closet that I truly love. My hope is that seeing these points from my perspective, and then seeing them in action here and on my YouTube channel will help you do the same. At the end of the day, fashion should be fun and we should use it as a way to express ourselves. It should never be taken too seriously, but a little planning never hurt either, and I've found that a little work at the beginning makes the entire process a lot more enjoyable. First up let's discuss color palette. As a lover of neutrals with pops of color here and there, I am the happiest when wearing simple shades all year. 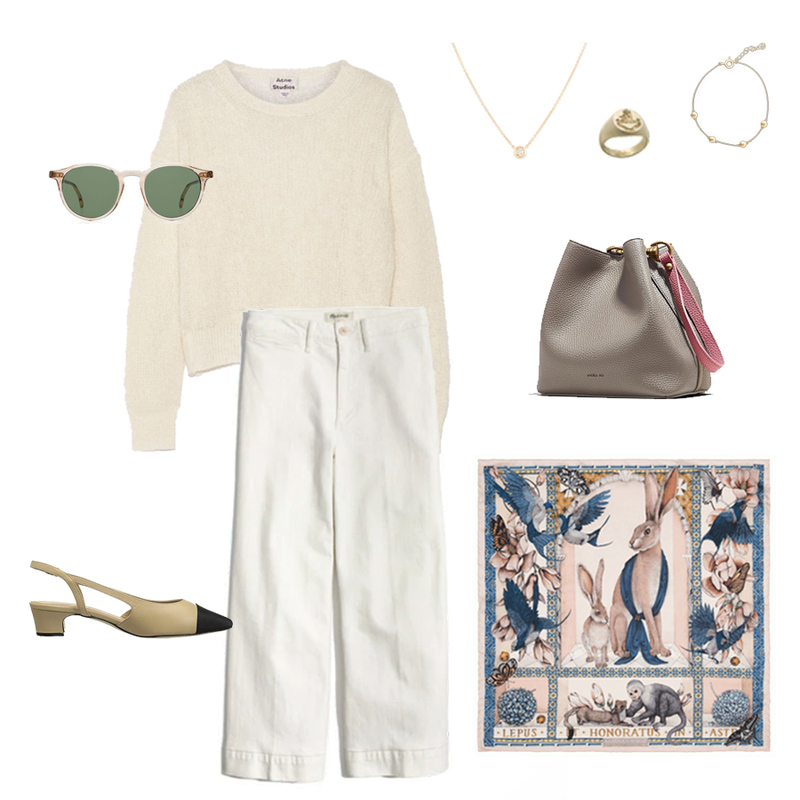 This streamlined color palette has worked so well for me as a base for brighter accessories, and I wear these shades all year. 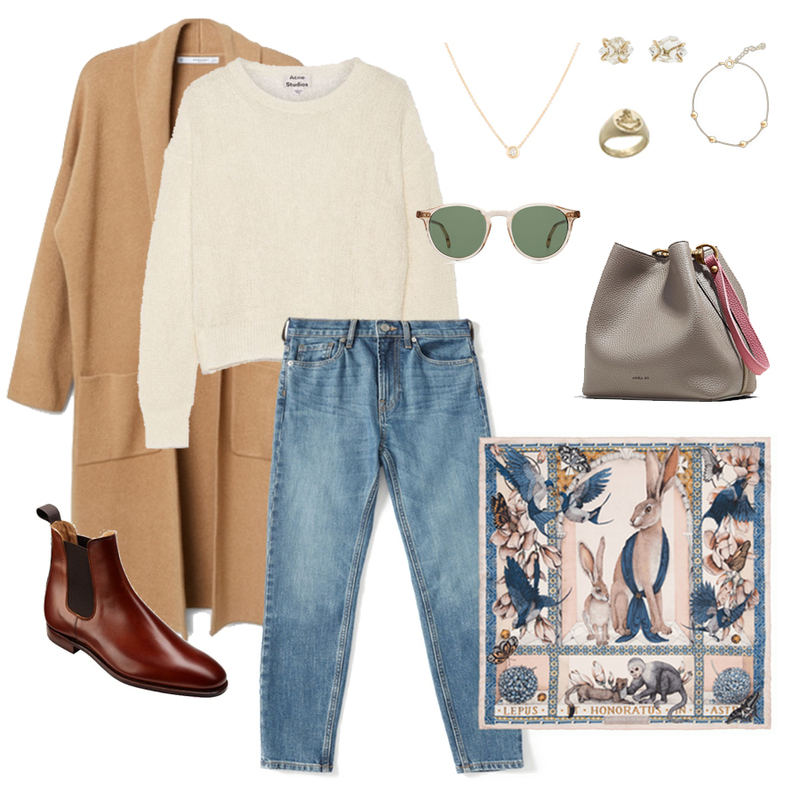 Not only are they incredibly easy to mix and match (nearly every color can be worn together with very little thought), but they work for me and all four seasons. Now, because I do love color I'm always trying to add a few bolder pops here and there and at the moment I have about 4 that I gravitate towards. Each of these make more of a statement than my base colors but still feel like me when done in small doses and are typically red/maroon, olive and pink. That said, I'm also usually the most comfortable when these colors appear in accessories rather than entire outfits - with a few exceptions of course. If you're having trouble narrowing in on a color palette that works for you, I go into a lot more detail in my eBook below. One of the things that really helped me lock in my personal style was picking a few descriptive words that described my aesthetic. The first time I sat down to do this I had too many words and as a result, I had a difficult time coming up with a cohesive style message. As I've worked on refining my style over the years, and have really allowed myself to grow into who I'm most comfortable being, I've narrowed it down to 4 words - classic, modern, elegant and relaxed. Though similar, each of these words touches on a different part of my personal style and ultimately my wardrobe, and are all critical to making me feel like me. To better understand these, let's break them down a bit further. CLASSIC: First up is classic. On the surface this word means exactly what it says - something that is simple and elegant and not greatly subject to changes in fashion. For me, this couldn't be more true. From fashion to makeup to home decor, I have always gravitated toward things that stand the test of time. I love the traditional and legacy of time tested pieces and have found that they are some of my favorite items to wear. I love feeling polished but understated and classics help me do that with very little effort. MODERN: Next is a piece of the puzzle that's critical to ensuring that I feel updated and never stuffy. As much as I love classics, I've learned over the years that wearing too many of them together can make me feel like I’m wearing a costume. 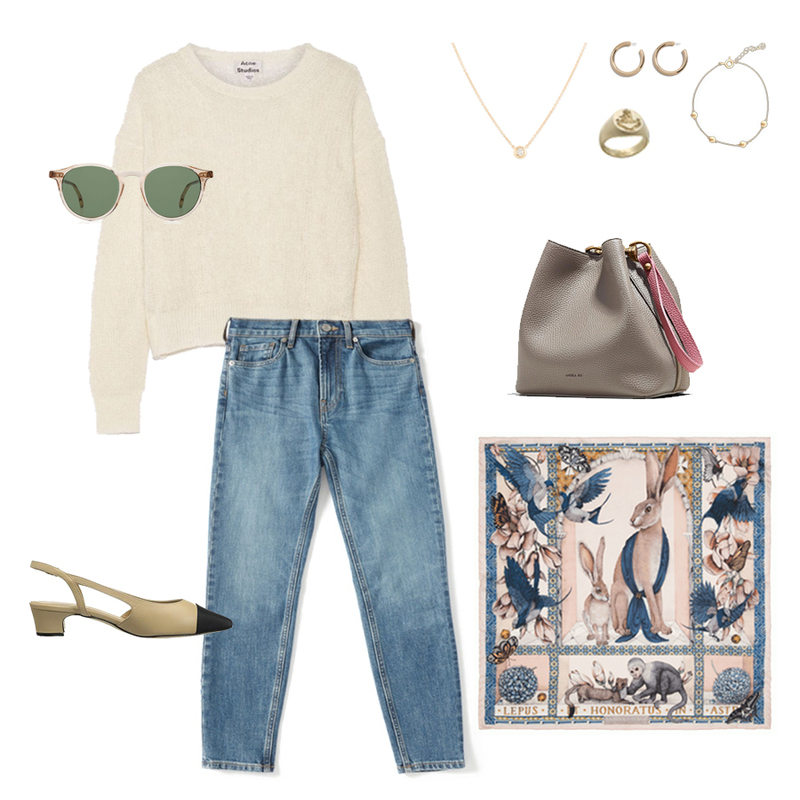 Without a few carefully selected modern touches my clothes wear me instead of the other way around so to combat this, I've learned that no outfit of mine is complete without a modern twist and I love pairing timeless classics with trendier items for a balance that feels 100% like me. ELEGANT: By definition, elegance is "pleasingly graceful and stylish in appearance or manner" and it's a piece of my fashion pie that I've grown to value over the years. After years of classic opera vocal lessons and ballet classes, I've learned that anything too trendy, too casual or too "cool" just doesn't work for me. We all know that our experiences shape who we are and for me, years of classical training (beginning when I was 10) have given me good posture, careful diction and thoughtful movements that feel out of place when paired with anything too grungy. Even though I love the look on others, it always feels out of place on me and instead, I'm much more comfortable in tailored, understated pieces that compliment my life's experiences rather than combat them. RELAXED: Last but not least is arguably the most important for me. Relaxed, which I use interchangeably with comfortable, is an absolute must for me. In fact, nothing ruins a day or an outfit for me quicker than being uncomfortable. I despise having to readjust, fidget or suffer when it comes to fashion and feeling relaxed is key to making me feel great in my clothes. I've learned the hard way one too many times that anything too stuffy, formal or complicated just doesn't get worn so now I avoid these pieces and I'm much happier. The 10 items that are always in my closet. Now that I've shared the colors I gravitate towards, the general feeling I strive for and how these keep me focused on pieces I'll actually wear, let's touch on the 10 items that are always in my closet. For me, these pieces are the cornerstone of great dressing and help me put together countless outfits that always feel like me. For you, these key pieces may look exactly like mine and for others they may be completely different. The key here is to learn what works for you and then wear those pieces with pride - even if it means that you wear the same "uniform" of a t-shirt and jeans almost every day. Also, these 10 pieces have worked beautifully for me and I've found that they are also relatively universal but the nuances between each of our own personal styles lie in the colors, cuts and silhouettes that we choose these pieces in. For example, I love a crisp white, collared button down but you may prefer a collarless pillowy white shirt. What's most important is that you select pieces that can serve as a base or blank canvas for your outfits, and always do so with your own unique personal style in mind. 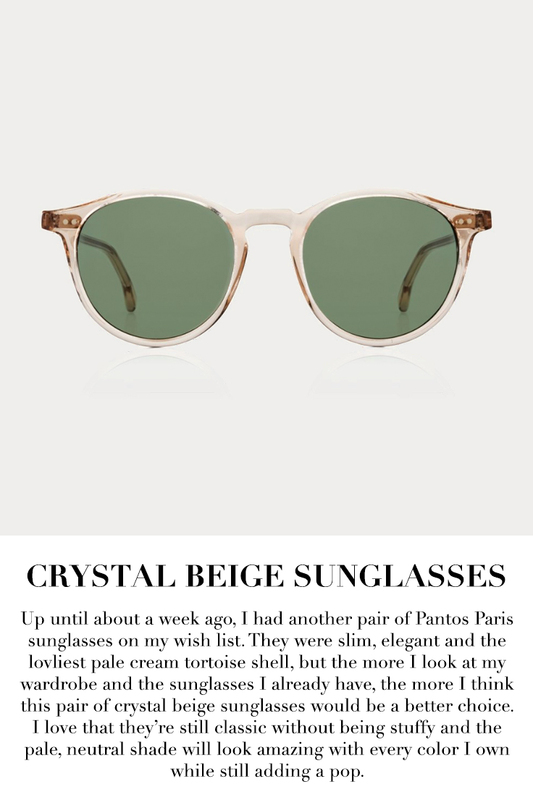 In order to build a well rounded wardrobe, and avoid impulse purchases I like to keep a running wish list of pieces I think will compliment my closet and my personal style. These include short term purchases and long term purchases - some that even require years of planning and saving. Here, I'm sharing the things I have on my list with you. I will continually update it as new things make their way onto my list and also if and when I decide that some things on this list won’t work after-all. You can click on any of the images to be taken to their purchase page if you're interested. Also, at the bottom I've included anything from the wish list that I've purchased or have been gifted so that you can see how the items go from wish list to purchase, and are actually incorporated into my wardrobe. You should also note that some affiliate links have been used below. This means that if you choose to shop from one of my links, I may make a very small commission from your purchase. This support helps me continue to make content. That said, none of these links or items are sponsored but I am occasionally gifted things from this list. Sponsored posts will and gifted things will always be disclosed and you can read more about my personal approach to ethical blogging here. Thank you so much for your support! 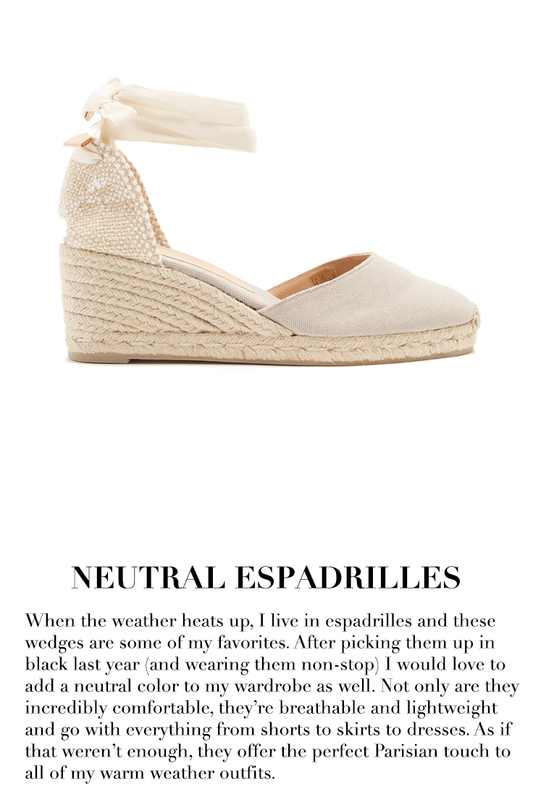 Below, I’ve rounded up anything that was on my wish list and has been added to my closet. Some of these items have been graciously gifted but the vast majority have been purchased by me. To learn more about how I work with brands and occasionally accept gifted items, you can read my full disclosure here. You can also see how I style them with my current wardrobe on my YouTube channel, here on my blog and over on my Instagram. Below, is a snapshot of where I like to shop for high quality items that stand the test of time. I’ve had very good luck with everything I’ve purchased from these retailers and I hope they help you as well. This sustainable, slow fashion brand offers a carefully sourced collection of timeless high quality staples that come collectively together under one roof. Scandinavian based we are focused on sustainable luxury and minimal elegance for women. We work together with vertical mills to create luxury staples that are affordable. I have their classic camel coat & absolutely love it! Hands down one of my favorite ways to build a closet full of quality pieces is to buy second hand and vintage. eBay is one of my favorite retailers for this and over the years I’ve found a vintage Gucci bag, luxurious cashmere sweaters, incredible blazers, Ferragamo boots and more for a fraction of what they would have cost new. A new favorite of mine is Naadam. 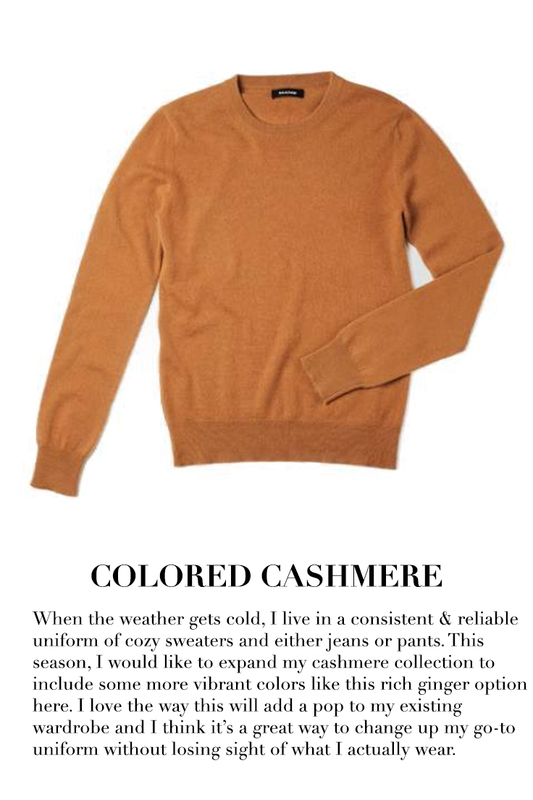 They make a fantastic $75 cashmere sweater that’s so soft and well made. I have their unisex sweater in orange and it still looks just as good as the day I bought it in fall 2018. I have heard that others have experienced pilling though, so like always do your own research before making a purchase. I’ll never forget the day I discovered Everlane. I was living and working in NYC and perusing a blog for a possible collaboration with a client at the time (I was working in beauty PR). The blogger was wearing the prettiest silk blouse and when I clicked through to the source, I was shocked to see it only cost $100! A few minutes later, I learned about Everlane and hooked. 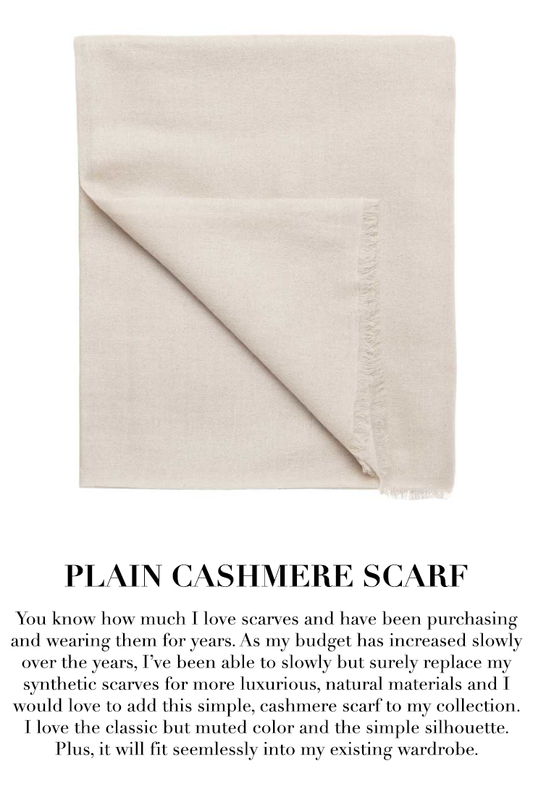 They’re still one of my favorite retailers for affordable cashmere & classic basics that last. Much like Everlane, Grana is disrupting the traditional retail space with transparency. 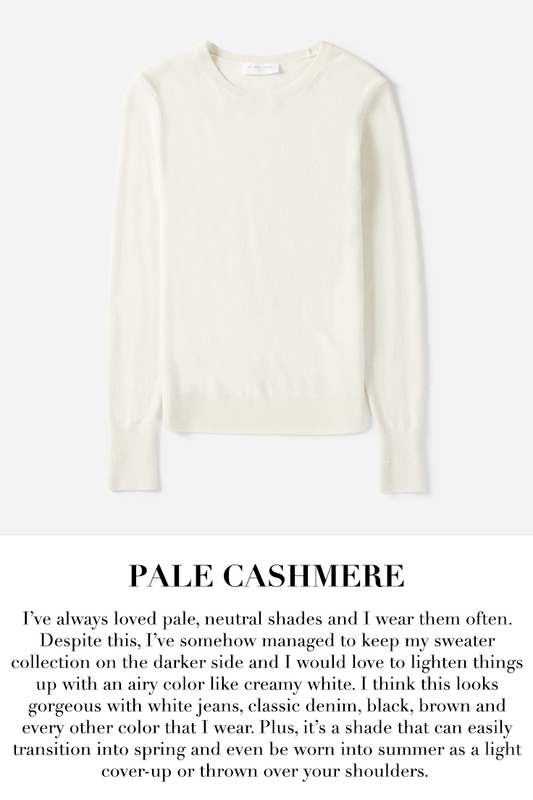 I personally have and love their cashmere, silk and cotton t-shirts. 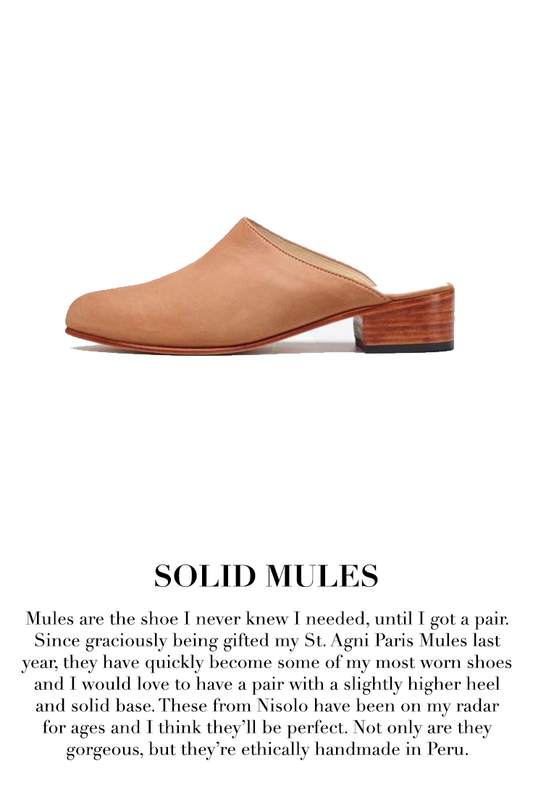 They’re also a good option for petites because they run slightly smaller than Everlane. As I’ve slowly grown my fine jewelry collection, I’ve placed a special importance on customizable pieces and a signet is one of them. Last year I was so lucky to work with them to bring my long time signet ring dreams to life and I shared my entire experience on my blog. In short though, this lovely family run business are true masters at their craft & if you’re looking for a custom signet or plain stone ring, you can’t go wrong. If you're interested in creating your own capsule or just need some help minimizing and focusing your existing wardrobe, this guide is for you! Inside you'll find a crash course in classic separates and an overview of the core 10 that are always in my closet and make up the base of each and every one of my capsules. You'll also find an easy to follow guide for selecting your ideal color palette, a sample capsule with 27 easy pieces for a year of outfits and of course, how to create your own capsule in 4 easy steps. 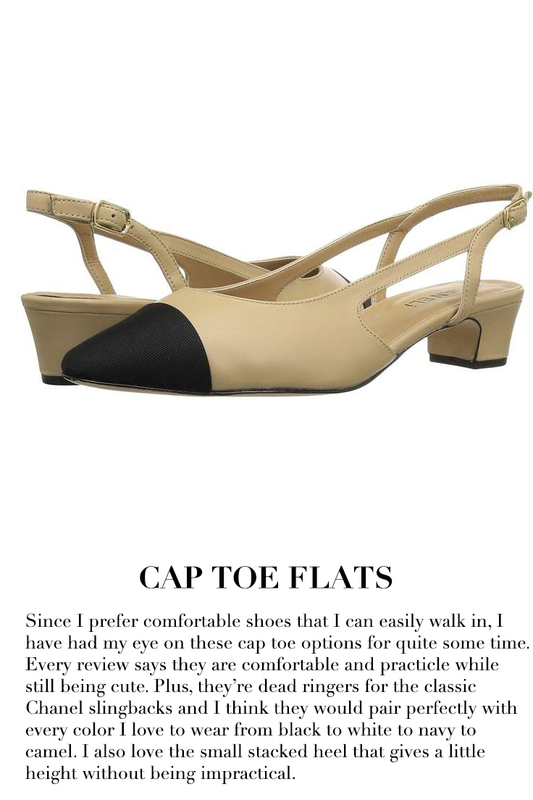 When it comes to building my wardrobe, I gravitate toward classic, well-made pieces that I can wear for years to come. 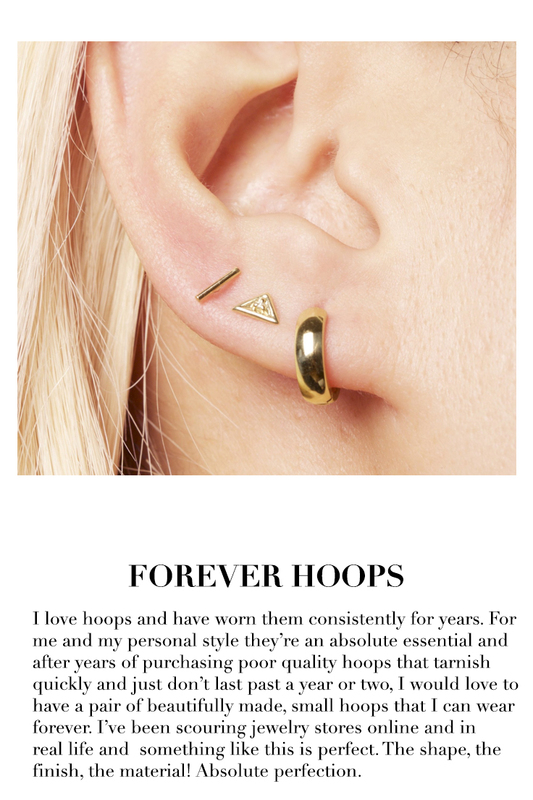 I extend this philosophy to everything from my blazers and sweaters to my footwear and jewelry, and with this ethos in mind, I have been slowly building a collection of classic, beautifully made, jewelry that I can wear and love for years to come. My newest jewelry addition is a signet ring and after years of searching I've finally found the perfect piece and enclosed here I'm sharing everything you need to know about choosing your own signet. This information and advise is as a result of my own extensive research and plenty of expertise from the incredibly knowledgable team at Ruff's Signet Rings which has been crafting these lovely pieces since 1904. I love beauty products, but I don’t like spending a ton of time on my makeup. I like products that stay put throughout the day, give me a natural look and work for every occasion without a lot of effort, and each of these deliver just that.